« If Parents Want Armed Teachers Who’ll Stop Them? Yes, Florida passed some minor gun restrictions, but follow the money and you’ll see the slaughter lobby and its allies will actually make millions on new guns in the schools programs and they didn’t have to pay for the damage their products do and policies cause. Programs that would actually cut into their revenue streams, like the assault weapon ban, were blocked. New Florida Laws: Teachers Will Be Armed These type of Assault Weapons Still Not Banned in Florida. 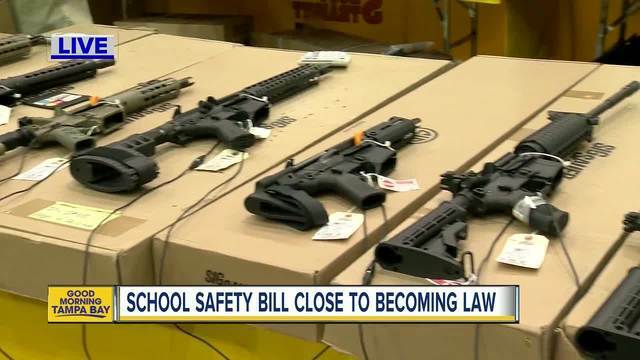 …when leaders responded with nearly a half billion dollars for school hardening and mental health programs, lawmakers were forced to wrestle with the proposal’s accounting – money in exchange for guns in the classroom. The governor will sign this, crowing he’s “Done something.” NRA legislative hypnosis is still working on both Democrats and Republicans. I’ve heard them use the “There is only so much we can do” line today. Bull. Now is the time to play hardball against the NRA. Demand a special session to ban assault weapons, taxes on guns and ammo and no taxpayer money for arming teachers training programs. Remember the “No AR-15 ban, No spring break money” plan? Ask the teacher’s union to walk out if armed teachers are put in place. Everyone is excited about the Parkland students because they aren’t paying the same game this time, neither should we. There are other venues and methods to use in addition to legislative. I love economic actions that convince corporations to disengage from the tainted NRA brand. Seek out, develop and support other actions that cut into the revenue streams for the gun makers and their allies. Remember, companies can be counted on to look out for their PR and financial best interests, use that force against the gun lobby and their allies. Here are Delta’s top 5 institutional shareholders, contact them and point out that Georgia politicians hurt one of their companies, Delta, financially. Ask, what are they going to do to help Delta? Should there be financial consequences to the politicians that did this to Delta? These politicians are always coming to you asking for money. Is giving money to these politicians in the best interests of your portfolio companies? Remember, it’s not quid pro quo if you don’t give money. Want to really punish these politicians? Dark money from hedge fund managers can dry up too. These politicians chose death merchants over your live kids. Dear Fund Managers for Berkshire Hathaway Inc , Vanguard Group Inc, Blackrock Inc., JPMorgan Chase & Co, Primecap Management Co.
Leave the gun lovers, take the cannoli. It’s nothing personal, it’s just business. Come ON people, get Chris Rock to do his Tax Bullets bit for the legislators! Why wasn’t this program tied to a massive gun and ammo tax? Whatever happened to the idea that new bills should be revenue neutral? This could have been an unfunded mandate from the state to local communities, instead it became a state-funded program. Also, how much you want to bet that these programs will be subcontracted out to an NRA-approved tactical weapons training firms? There could have been a provisions blocking that from happening. Once again the NRA lobbyists got money for their allies, for their guns everywhere programs from taxpayers. Insurance could have been a real poison pill for this amendment. In Kansas the inability to get insurance stopped the armed teacher program. Why weren’t the insurance companies rolled out to testify about costs and liabilities? Which insurance carriers are going to cover it? How much are the premiums per year? Who pays for this? If schools can’t get insurance, they can’t stay open. No insurance, no armed teachers. The NRA anticipated this, so maybe they did what I’ve seen them do in Tennessee, having lawmakers give immunity, avoiding liability. My suggestion, look closer at the policies! What don’t they cover? Who is liable for gun accidents? Also, will immunity hold up in court? Challenge it. In a NRP story a Parkland parent talks about how Representative José R. Oliva (R) 93% Rating from the NRA. added an amendment that would provide funds for sheriffs to train armed teachers. “They are willing to accept it in order to get the rest, especially because they don’t think it will ever happen. The bill gives both the sheriff and the school board the power to block it.” Rep. José R. Oliva added an amendment that would required sheriffs to develop training programs for teachers who want to carry guns. So now everyone who opposes this will need to go to each sheriff’s department and tell them to not offer it. “But we want to offer it and we have the money!” School boards will hear from gun-loving parents who think it’s a good thing to do, and who will demand it. Especially after the next mass shooting. Prior to the activism following the Parkland shooting the idea that “The NRA always wins.” had paralyzed and depressed everyone. This new round of student activists have opened up possibilities for people. For the parent in the NRP story, who was shocked at how rigged the system was, she can try to change the system. We know the NRA is a sophisticated and experienced foe. It likes to activate its members to overwhelm and control the battle grounds. A shift to the local school boards against the armed teachers program will take time and resources. I know my friends at Nebraskans Against Gun Violence are already on top of it, educating their local school boards. (Link to School Board Doc Toolkit) NAGV Overview – Schools and Guns PDF But parents and GVP groups need to do more, not just fight holding actions. In Nebraska they are pushing for taxes on guns and ammo to pay for the damage the slaughter lobby does. I’m not a paid strategist fighting the gun lobby. I wish I was. I tried to be, but apparently my pointy ears got in the way of my credentials fighting right-wing media. Vulcan discrimination! However, I encourage people who are working on this to keep pushing hard and think 4th dimensionally – develop actions that work together over time. We need actions that have impacts economically, technologically. culturally, and politically. As a friend pointed out to me, change is inevitable, predictable, beneficial. We need to keep pushing until we get what we want. The students say, “Never again.” I hear them. Let’s make sure everyone does.